let the installer automatically find a driver update disk. let the installer prompt you for a driver update. use a boot option to specify a driver update disk. use a boot option to specify a driver update image file on a network. select a PXE target that includes a driver update. Attach a block device with the filesystem label OEMDRV before starting the installation process. The installer will automatically examine the device and load any driver updates that it detects and will not prompt you during the process. Refer to Section 13.2.1.1, “Preparing to use an image file on local storage” to prepare a storage device for the installer to find. Select Use a driver disk and refer to Section 13.4, “Specifying the location of a driver update image file or driver update disk”. This method only works to introduce completely new drivers, not to update existing drivers. 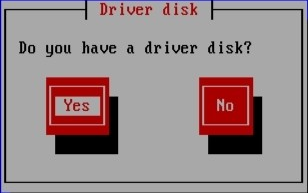 Insert the driver update disk that you created on CD, DVD, floppy disk, or USB storage device and select Yes. The installer examines the storage devices that it can detect. If there is only one possible location that could hold a driver disk (for example, the installer detects the presence of a floppy disk, but no other storage devices) it will automatically load any driver updates that it finds at this location. If the installer finds more than one location that could hold a driver update, it prompts you to specify the location of the update. Refer to to Section 13.4, “Specifying the location of a driver update image file or driver update disk” . Type linux dd=URL (where URL is the HTTP, FTP, or NFS address of a driver update image) at the boot prompt at the start of the installation process and press Enter. The installer will retrieve the driver update image from that address and use it during installation. Select network boot in your computer's BIOS or boot menu. The procedure to specify this option varies widely among different computers. Consult your hardware documentation or the hardware vendor for specifics relevant to your computer. In the preexecution boot environment (PXE), choose the boot target that you prepared on your PXE server. For example, if you labeled this environment r5su3-dd in the /tftpboot/pxelinux/pxelinux.cfg/default file on your PXE server, type r5su3-dd at the prompt and press Enter. Refer to Section 13.2.3, “Preparing an initial RAM disk update” and Chapter 34, PXE Network Installations for instructions on using PXE to perform an update during installation. Note that this is an advanced procedure — do not attempt it unless other methods of performing a driver update fail.